The majority (64%) of the 55 economists polled—not all of whom answer every question—said that the economy would get better over the next 12 months and 9% said it would get worse; the rest said it would stay about the same. In contrast, the latest WSJ/NBC News poll found 33% of the general public expected the economy to improve and 23% think it will get worse. The difference may depend on the definition of “better.” The economy is “doing better, but not yet doing well,” said Neal Soss of Credit Suisse. Economists, on average, now see the odds of double-dip recession at 20%. On average they expect the economy to grow at a pace below 3% through the second quarter of 2011, so slow that they anticipate the unemployment rate, now at 9.5%, will drop to just 8.6% by the end of 2011. The broad public is implicitly wrong; the 55 selected economists are implicitly right; and “the difference may depend on the definition of ‘better. '” Indeed. The economists and public were in line on their views of President Barack Obama’s handling of the economy. Half the respondents to the WSJ/NBC poll disapprove of it; 46% approve. Among the economists, 29 or 64% of those who answered the question disapprove. And similar majorities of the public (63%) and the economists (70%) agree that Congress should focus on reducing the budget deficit even if it means it will take longer for the economy to recover. So even though economists think it’s going to improve, the reason it will improve is because of a policy they disapprove of; 70% of the economists would be happy to slow down the improvement by deliberate short-term government policy. “The public” becomes the straw man for this story, something to define the economists against. The two polls were taken independently, nearly a month apart. “The public” was represented by 1000 adults who presumably believe that “your opinion is important to us” (22% are retired). They were asked qualitative questions, i.e. “During the next twelve months, do you think that the nation’s economy will get better, get worse, or stay about the same?” The 55 economists were asked for numeric forecasts for GDP, CPI, unemployment, housing starts and prices, and crude oil prices, by quarter, for the next year. They were also asked a dozen specific questions, four of which matched those asked in the public poll. PS: I want to acknowledge one aspect of the overall process used by The Wall Street Journal in developing its coverage of this story. Even non-subscribers can download the original data used for its reporting (although the xls-format document provides only aggregate numbers on the qualitative answers from the economists and you have to hunt for the public survey). You can also download previous forecasts, and chuckle when they miss the mark by a mile, or marvel when they’re on the money. My credo for this site is: Write what you will, but always try to provide the source material used to form your judgment. Readers in return have the option for an informed assessment of your opinion rather than the worthless nattering that passes for commentary on most websites. And so kudos to the WSJ. By examining all of the data offered, and gathering some extra (all of it referenced and linked) I’ve formed my judgment. My roundabout point is that the economists working with The Wall Street Journal inhabit a different world than “the public.” Most of them work for large financial institutions, including Morgan Stanley, BofA Merrill Lynch, Goldman Sachs, J.P. Morgan, Deutsche Bank, Moody’s, Barclays Capital, Wells Fargo, and Credit Suisse. Why would anyone compare the opinions of this group to Joe Q. Public? I looked closely at several of the quantitative answers provided by the economists and compared those to the key qualitative response to the question “During the next twelve months, do you think that the nation’s economy will get better, get worse, or stay about the same?” As reported, the qualitative answer was 64% better, 9% worse, 26% stay about the same. As noted above the journalist Phil Izzo explained, “The difference may depend on the definition of ‘better. '” Apparently it’s not just GDP, as 40% of the economists believe that it will be smaller at the end of 2011 than at the end of this year (9% think it will be the same). Perhaps it’s unemployment, where all but one economist sees the percentage dropping by end of next year (although from a bleak 9.4% to a less-bleak 8.6%). Nearly 6 out of 10 see consumer prices rising, not generally a good thing. All but one of the 44 who ventured to predict housing prices sees an increase next year; the one who thinks they’ll hold steady next year believes the improvement will happen this. Economists and homeowners can crack a half-smile; renters (a third of the population) a frown. Still the predicted improvement is less than 2% for prices that, according to the latest S&P/Case-Shiller Home Price Indices report, are currently running at 2003 levels. The Wall Street Journal, so central to this entry, also reported separately today that “weak industrial output and a drop in wholesale prices point to a slowing in the economic recovery.” It’s a world of contradictions. (i) There are slightly more women than men in the U.S. The economists: 53 male; 2 female. (ii) 38% of the population is age 18-44. I didn’t check everyone on the list of economists, but of those I checked, one appeared possibly to be younger than 44. Most are much older. I doubt that 5% of the group of 55 are between 18 and 44 years old. (iii) Some 60% of the survey respondents lack even a bachelor’s degree. All of the economists have postgraduate degrees. (iv) About 80% of U.S. households have incomes below $100,000 per year. About 100% of the economists have household incomes above $100,000 per year. (v) 47% of the public survey respondents did not “know enough to say” what they thought of the nomination of Elena Kagan to the Supreme Court. The economists were not asked this question, but we can imagine that few would admit that they didn’t know enough to express an opinion on this important current issue. (vi) CBS News conducted a similar public poll to the NBC/WSJ poll, except the CBS poll ran July 9-12, a month later than the competition. Many of the questions were similar; so too the answers. The major difference is that CBS probed more deeply into the economic circumstances of respondents. Both surveys found nearly 60% of respondents employed. CBS found 14% of its respondents “temporarily out of work”; NBC/WSJ only 7% “unemployed, looking for work.” It gets worse. And these people are supposed to be optimistic about the economic future? That 25% felt the economy “is getting better” seems a tribute to Yankee optimism. When 48% think the economy is “staying about the same” that means they think it’s staying crummy. I wonder how the WSJ economist’s panel would respond to these same personal issues. (vii) Finally, if you ask an economist a question like “During the next twelve months, do you think that the nation’s economy will get better, get worse, or stay about the same?” the economist, by nature of his or her training and profession, will perceive the question, per se, very differently than a member of the public. 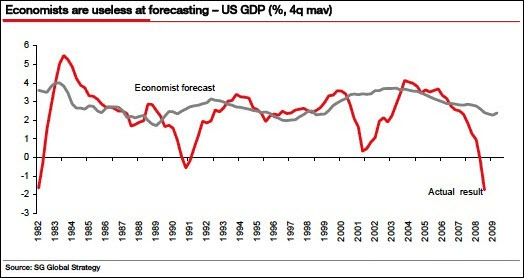 If the economist foresees even a 2-3% improvement, the honest and professional answer is “yes”. For Joe Q, 3% is imperceptible, not within focal range. Yet here are the public’s bleak perceptions: The average American thinks the number of jobless is four times higher than it actually is. Nearly 1 in 4 believes the current unemployment rate tops 25 percent — the proportion of Americans who were estimated to be out of work at the worst of the Great Depression. They believe that prices are rising four times faster than they really are and that the federal budget deficit is higher, not lower, than it was five years ago. And 7 in 10 say there are fewer jobs than there were five years ago. This wide gap between economic perception and reality helps explain the wary public mood this election year. The economy is growing and statistics show that the average American is benefiting in many measurable ways. Yet many people don’t see these gains reflected in their lives. Instead, they’re looking anxiously at friends and neighbors who aren’t sharing in the gains — and worrying about an economy that appears much harsher to them than the facts seem to warrant. These misperceptions, from overestimating the unemployment rate to underestimating gains in family income, cloud and confound the public’s view of the nation’s economy, according to a new survey by The Washington Post, Harvard University and the Henry J. Kaiser Family Foundation. Some fourteen years later the problem for the lawmakers in Washington remains that at election time the public perception of the economy is more important than the analysis of the economists. Newspapers like The Wall Street Journal fulfil their appointed roll by trying to get the public to see things in the same way as the powers that be. You’re wrong, Joe Q — the experts know better. Elect a Republican in November and your pain will soon be over.